Fig. 3. 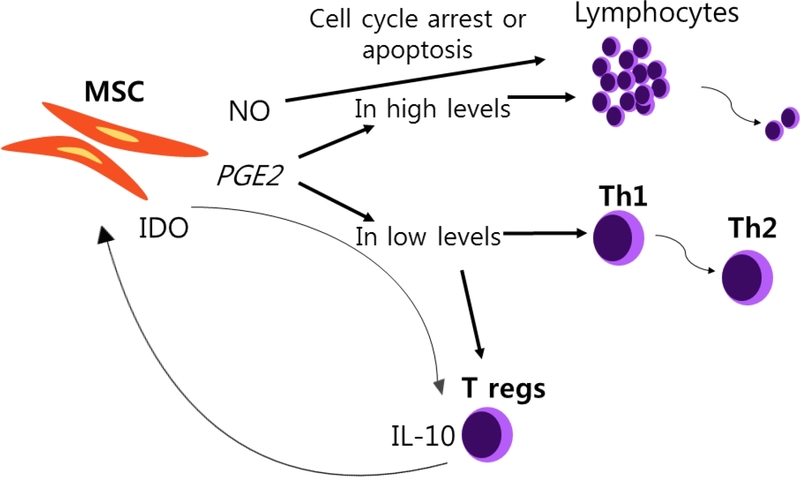 Role of PEG2 and NO produced by MSC for immunosuppression. As MSCs are activated, they secrete various factors, among them, the anti-inflammatory prostaglandin E2. Depending on the environment, secretion levels of PEG2 will vary. If found in high levels, it can inhibit lymphocyte proliferation by reducing interleukin-2. In low levels, it can change Th1 to Th2 by blocking pro-inflammatory cytokines and it can also help induce T regs. At the same time, T regs can induce IDO secretion of MSC, and this works in synergy by helping T regs to produce the anti-inflammatory IL-10. Nitric Oxide can also produce an inhibition of T cell proliferation by inducing cell cycle arrest or apoptosis.